Joan often mentions events of the day in her journals. 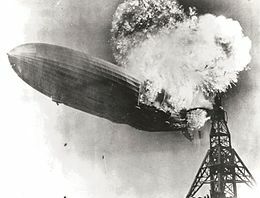 Here she writes about hearing of the famous Hindenburg disaster. The announcer’s eyewitness report is heartbreaking and famous. Listen to it here. Read about the Panay bombing and its importance in the lead-up to Pearl Harbor. To see the newsreel Joan saw, go to this site. 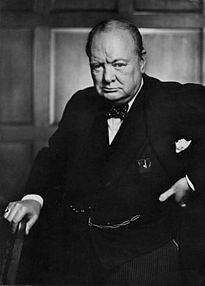 Winston Churchill gave many important speeches that people heard on the radio. Joan tells about a number of them, though she didn’t really seem to admire him, calling him “pigface” more than once! This famous photo was taken by Yousuf Karsh from December 30, 1941. Maybe England shall go down. I was thinking of Cicero today as we heard Churchill. And how those brave words would sound when some schoolboy is translating them, a thousand years hence. Maybe England shall fall. I guess so. I don’t know. You can read and hear some of Churchill’s speeches. First of all, you may want to investigate the Churchill Centre and Museum at the Churchill War Rooms, London. May 19, 1940. Churchill’s first speech as Prime Minster (section of audio speech). Jan. 20 1941. “Sail On Oh Ship of State.” Here is a section of the audio version. Broadcast from February 9, 1941. “Give Us the Tools” section of audio. Here is the entire written speech. Joan admired the President of the University of Chicago, Robert M. Hutchins. She relates how he gave a number of speeches, some of which have since become famous. Another important speech Hutchins’ gave is here. It is the convocation address from June 14, 1941, shortly before the war began. 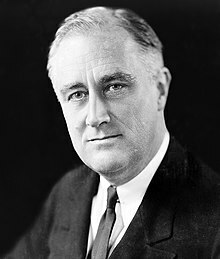 President Franklin Delano Roosevelt gave many important speeches and fireside chats during his long presidency (1932-1945). Here Joan tells of one speech he is to give.
. . . Roosevelt to speak tomorrow. “Important,” they say. It was to have been Tuesday but on account of his mother’s death they put it off. . . . They say he’ll say, “Shoot without being fired upon”—to our ships. I dunno. Well, we shall all die; somewhere over the far hills death is already written for such as us. . . . I am young, but an ancestress of mine may have died younger. . . .
Here’s the speech he actually delivered on September 11, 1941.